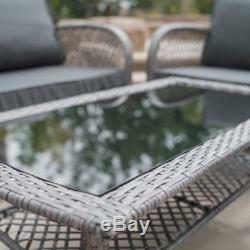 4-piece Patio Set Deep Seating Cushion Resin Wicker All-Weather Glass Table Gray. 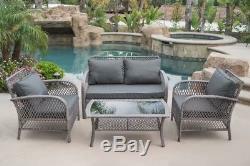 Relax in style with the 4 Piece Patio Set. A perfect mix of comfort and elegance, offers amazing value in outdoor living. The Collection features deep seating chairs, and a side table offering the luxury of resort-style amenities in the comfort of your own home. Neutral tones and defined lines across all components of the Collection allow you to customize your ideal outdoor space. Personalize Your Outdoor Space - Lightweight components can be moved to fit perfectly in your outdoor space. 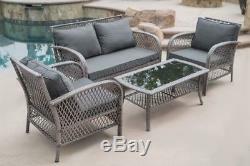 Attractive Set- Outdoor gatherings with your friends and family will be delightfully stylish with this attractive and durable wicker chat set. Deep Seating - Featuring true deep seating, thick wrapped cushions, achieves easygoing beauty with a grand presence. Simple Contemporary- Design of this patio set suits a range of tastes and preferences, which complements any Outdoor/Indoor living space. All Weather Resin Wicker- All weather resin wicker gives the look & texture of natural wicker with the durability, weather and UV resistance of resin. Pattern Woven- Beautiful diamond pattern woven into the design adds a touch of class. Sophisticated Touch- Table with removable glass piece adds a sophisticated touch and allows you to place drinks, meals, or decorative items on top. Relax- Instantly create the perfect area for your morning coffee or lunch with a loved one. Sturdy Frame- Constructed with high quality steel frame materials that are engineered for optimal outdoor use. Removable Cushions- Covers for easy cleaning, simple to clean. Minimal Assembly- Simple and minimal assembly is required. 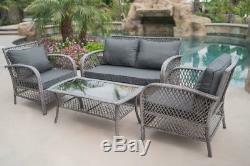 Material: Wicker/Rattan & Steel Frame. Maximum Set Seating Capacity: 4. 42"(L) x 21"(W) x 17(H). 17"(W) x 24-1/2"(L). 27"(W) x 26-1/2"(L) x 32(H). 45-3/4"(W) x 17"(L). 50"(L) x 27-1/2"(L) x 32(H). Note Our digital images are as accurate as possible. However, different monitors may cause colors to vary slightly. Ships from our 400,000 sq ft in 2 facility in Los Angeles and Indianapolis. Order before 4am EST Mon-Fri. Item will usually be delivered. Onebigoutlet is one of America top online suppliers of specialized Home Furniture, Home Appliances, Garden products, and High Quality Aftermarket Car Parts. How do I cancel my order? You have 24 hours from the time you place your order to cancel. Do you deliver on weekends? Why isn't my coupon working? Your coupon may have expired. Only one discount applies per order. We do not offer installation services. I received an incomplete order missing parts, manual, etc. Why was my order cancelled? This listing is currently undergoing maintenance, we apologise for any inconvenience caused. 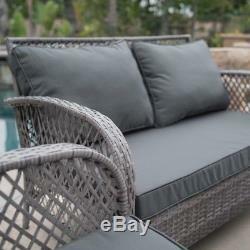 The item "Outdoor Patio Furniture Grey PE Wicker 4pcs Luxury Sofa Seating Cushioned Set" is in sale since Tuesday, June 26, 2018. This item is in the category "Home & Garden\Yard, Garden & Outdoor Living\Patio & Garden Furniture\Patio & Garden Furniture Sets". The seller is "onebigoutlet" and is located in Rowland Heights, California. This item can be shipped to United States.